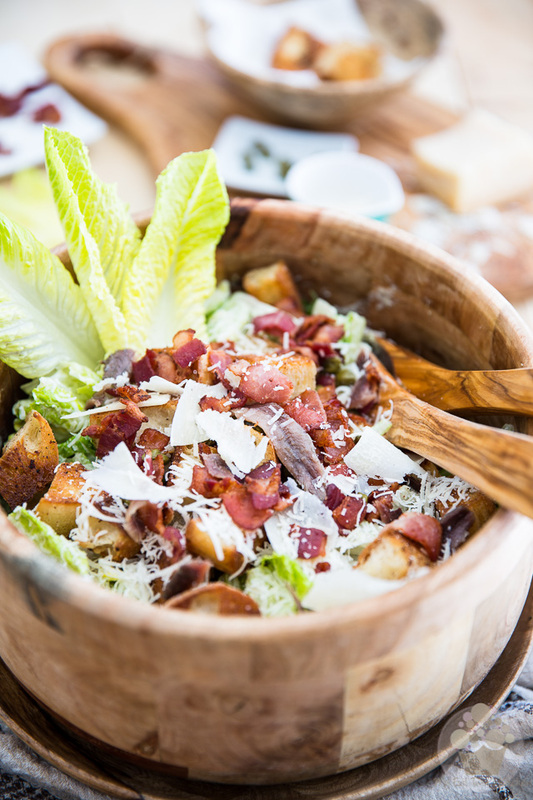 Making Caesar Salad from scratch isn’t as complicated as you may think and your efforts will be highly rewarded with a totally enchanting experience. I’ve often been told that I make a pretty wicked Caesar Salad. In fact, I’ve been told many times that I make the absolute best Caesar Salad this side of the continent. At the risk of sounding a tad pompous, I must admit that I tend to agree with these declarations. I don’t know about where you live, but in my part of the world, for most people, and even restaurants, Caesar Salad consists of Romaine lettuce, covered-up in store-bought dressing and then topped with dry and crumbly boxed croutons, artificial bacon bits (the very thought of these abominations makes me want to gag) and then sprinkled liberally with the shake-able white stuff that’s trying to pass as Parmesan cheese. 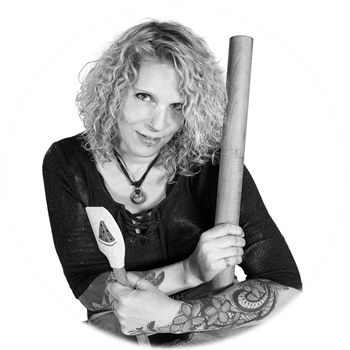 And most people do it that way because they simply don’t know any better… they think that one simply CANNOT make Caesar Salad entirely from scratch, or that it’s an extremely lengthy and complicated process if it can be done at all. If you plead guilty to that, then by all means, you must read on. 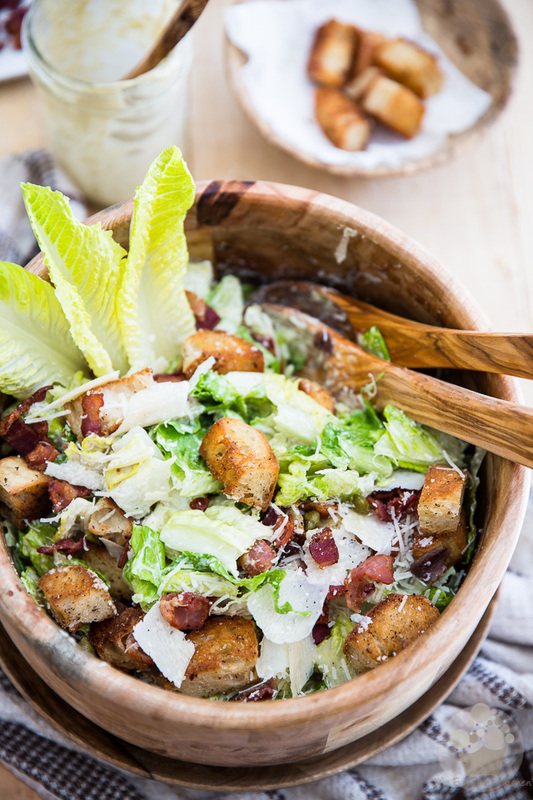 Caesar Salad can be a total enchantment to the taste buds, when made right. I’m not going to lie, it demands a little bit of time and preparation, but your efforts will be mightily rewarded, believe you me. 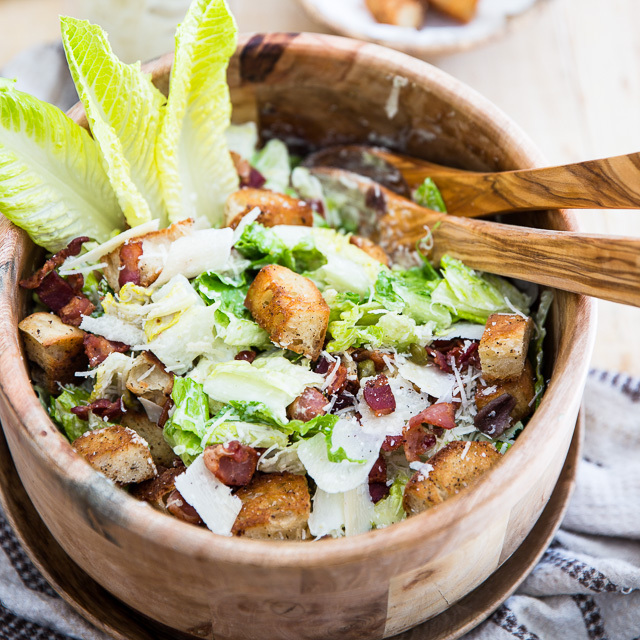 I’m telling you, once you’ve had a taste of this Caesar Salad made entirely from scratch, you’re never gonna want to have it any other way. And you’re gonna want to be serving it every chance you get! First and foremost, Caesar salad must imperatively be assembled at the last possible minute. You could make the dressing in advance (in fact, it will keep in the fridge for a couple of weeks) and you could potentially make the croutons ahead of time, too, although they truly are at their best when they’re fresh out of the pan. An immersion blender. 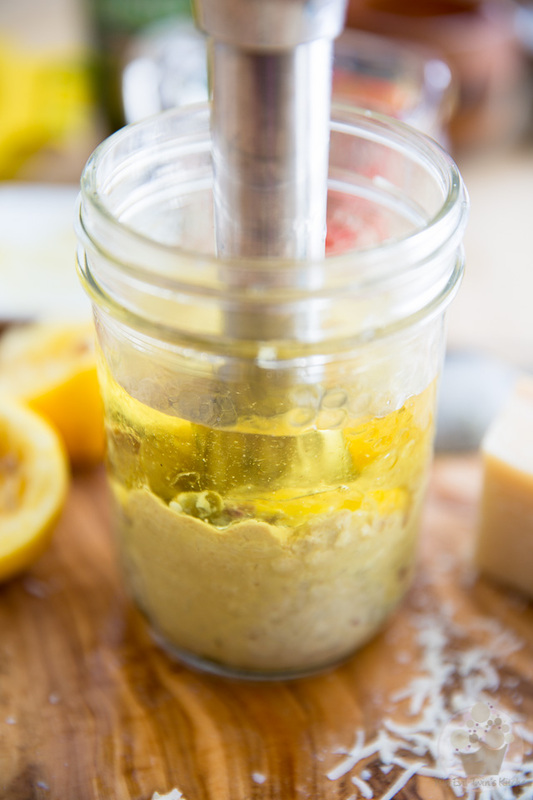 This is the magic tool that will make the emulsion happen, so that your dressing becomes really thick and creamy. If you use a regular blender, your dressing will always remain somewhat thin and pourable. Last but not least, don’t ever use full flavor extra-virgin olive oil. Not only is its flavor way too strong for this use, but it also seems to intensify when emulsified, which is totally not a good thing. Trust me, it will completely ruin your precious dressing. Stick with extra light tasting olive oil or avocado oil. Got all this? You ready? Let’s get started! Next, add all the ingredients, except for the oil, into your glass jar. Remember, you want to use a jar that’s barely wide enough to accommodate the head of your stick blender, such as a 500ml (1 pint) wide mouth Mason type jar. As you can see, there’s no need to chop or prep anything, the blender will take care of it all for you. Well, except for maybe the Parmesan cheese. I don’t recommend throwing a whole block in there. That, you may want to grate! 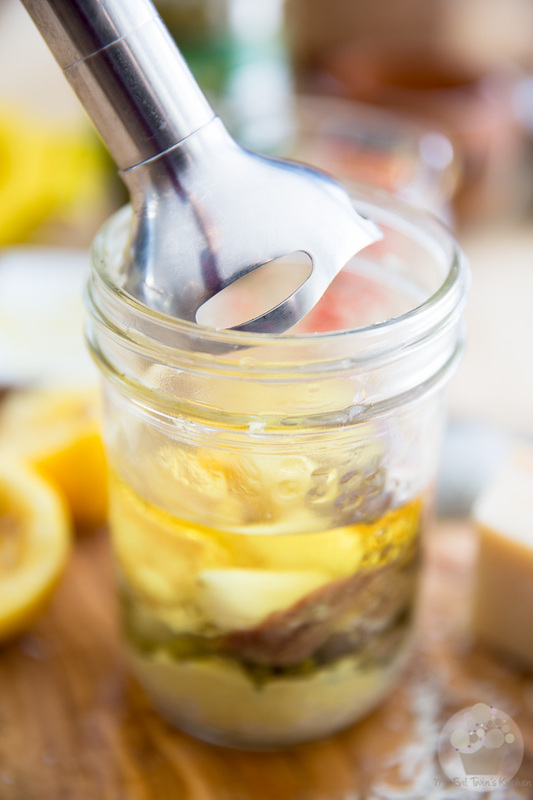 Once all the ingredients have been added to the jar, pour the oil right in. Again, about the oil: it’s VERY IMPORTANT THAT YOU USE EXTRA LIGHT TASTING OLIVE OIL and NOT full flavor. The latter is way too strong and its flavor seems to intensify in the emulsification process. As an alternative, you could use avocado oil, which also happens to be a very good quality oil (my personal favorite, in fact) that has a very mild and neutral flavor. See how the head of my blender is about the same size as my jar’s opening? This is the kind of fit you’re looking for. Now stick your immersion blender all the way down, ensuring that it makes full contact with the bottom of the jar. Press the power button and very slowly lift the blender all the way to the top, keeping it as straight as you can as you move it up, until your dressing is fully emulsified and turns a beautiful shade of creamy white. Once that’s happened, you can move the blender around and up and down to make sure that you get every last bit of oil mixed in. And that’s pretty much how it goes in real time… pretty cool, eh? And that’s your finished Caesar salad dressing. Thick and creamy enough for you? Now time to make the croutons: to do that, you will need to first cook the bacon in a large skillet set over medium heat, until it’s nice and crispy. Add the cubed bread to the skillet. Here you could use pretty much any bread you want, but I find slightly stale bread works best. My favorite bread to use is a 2 day old French baguette. If you don’t have time to let your bread age, just make sure that you pick a bread that’s fairly dense and that has a nice substantial crust to it. Cook the diced bread in the bacon fat, tossing the cubes around from time to time, until the croutons are nice and golden brown on all sides and all that tasty bacon fat has been absorbed. 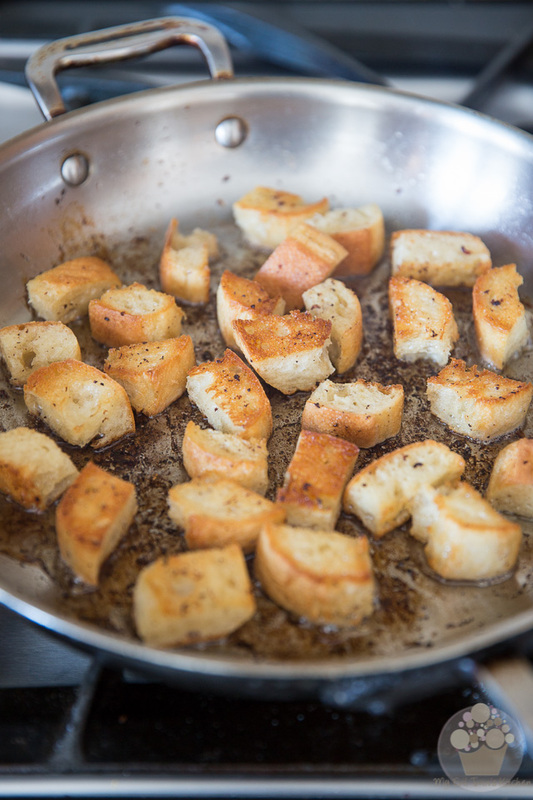 As soon as they’re ready, transfer the warm croutons to a bowl to prevent overcooking. Totally addictive, is what they are. Whatever you do, if you don’t use them right away, put them somewhere out of sight, else there won’t be any left to go in your salad! 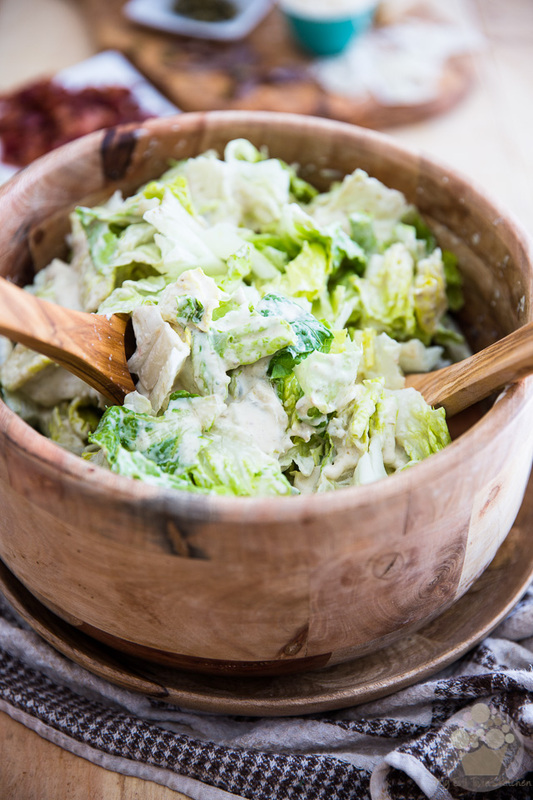 Tear the romaine lettuce into bite size pieces and place it into a large salad bowl and then pour the dressing all over that lettuce. Feel free to use as little or as much dressing as you like. Personally, I always use the whole batch. I like my Caesar salad with lots of dressing! Toss delicately until the lettuce is completely covered in that beautiful, creamy dressing. 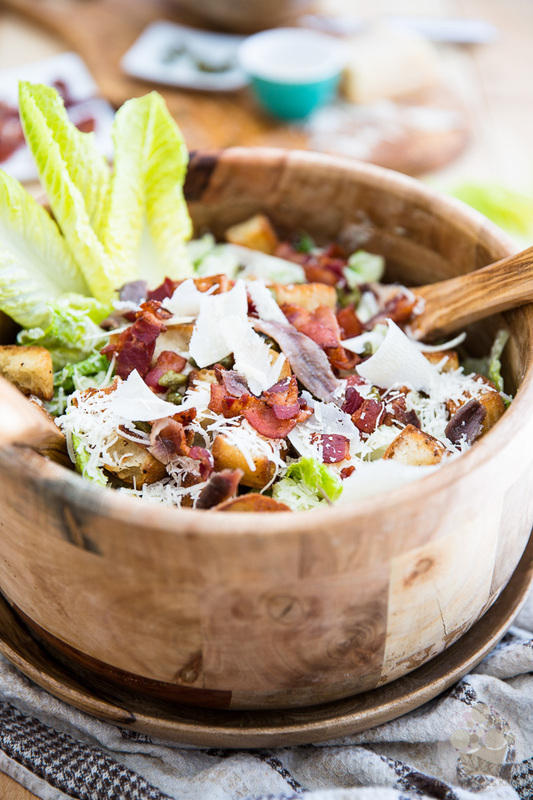 Finally, top the salad with the warm croutons, crispy bacon bits, shredded Parmesan cheese (I added a few shavings, too, why not? They look so pretty!) chopped anchovies and capers. And now, serve without delay, for this salad does not keep well at all. 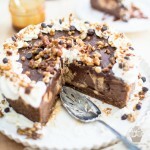 It DEMANDS to be eaten the moment that it is dressed. Hey, Caesar waits for no one! 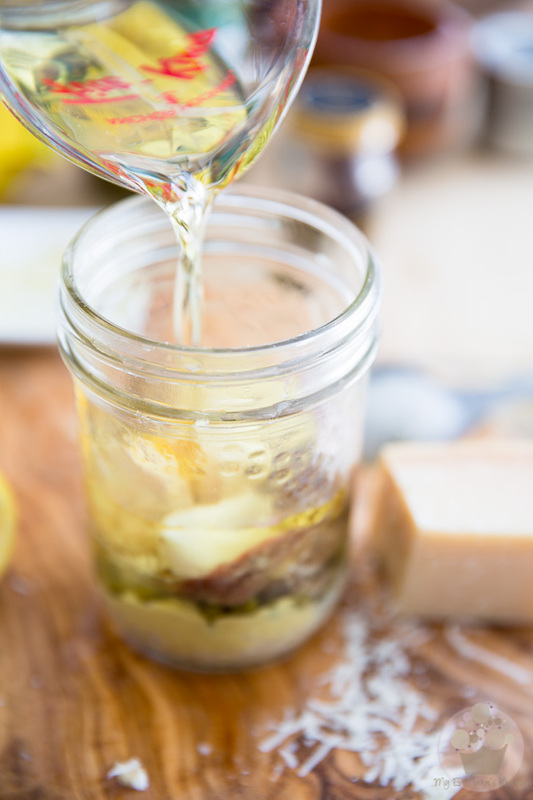 Make the dressing: add all the ingredients, except for the oil, to a tall and narrow glass jar that's barely wide enough to accommodate the head of your stick blender. A 500ml (1 pint) wide mouth Mason type jar works wonders for this. 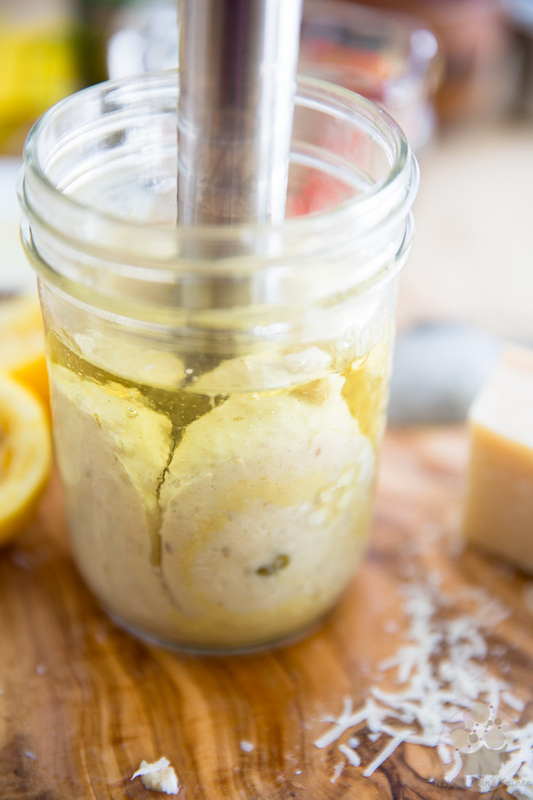 Once all the ingredients have been added to the jar, pour the oil in and then stick your immersion blender all the way down, ensuring that it makes contact with the bottom of the jar. 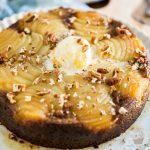 Press the power button and very slowly lift the blender all the way to the top, keeping it as straight as you can as you move, until your dressing is fully emulsified and turns a beautiful shade of creamy white. Once that's happened, you can move the blender around and up and down to make sure that you get every last bit of oil mixed in. Now time to make the croutons: to do that, you will need to first cook the bacon in a large skillet set over medium heat, until it's nice and crispy. 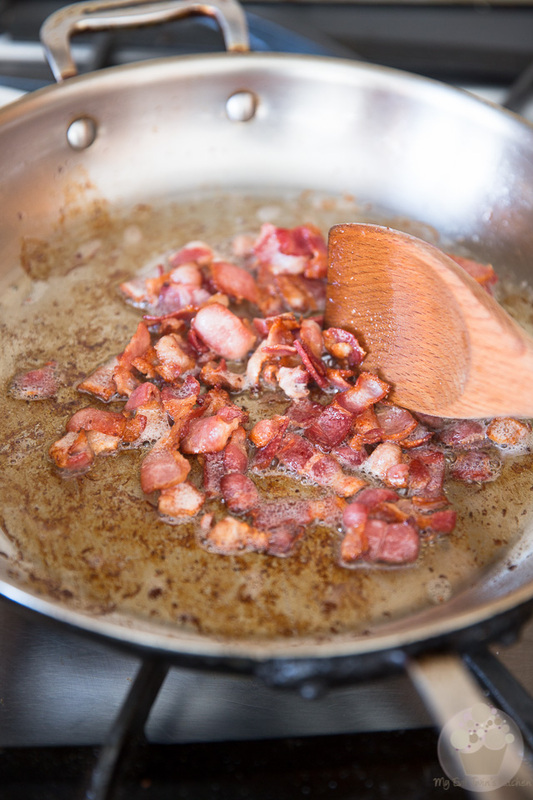 Once it's cooked to your liking, remove the bacon to a plate but leave the fat in the pan. 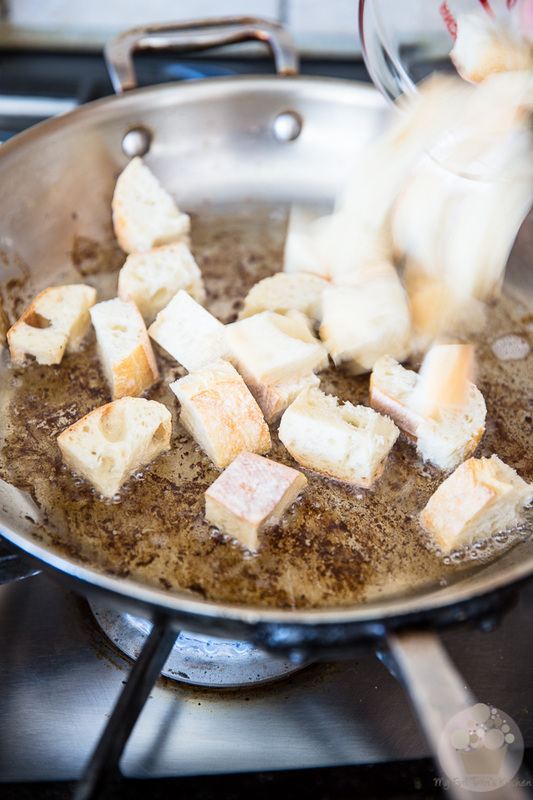 Add the cubed bread to the skillet and cook, tossing the cubes around from time to time, until the croutons are nice and golden brown on all sides and all the bacon fat has been absorbed. 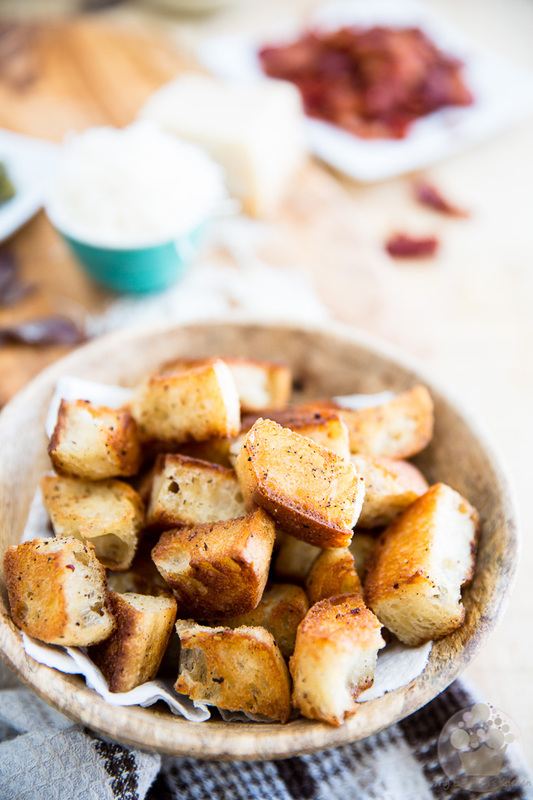 Transfer the warm croutons to a bowl to prevent overcooking. 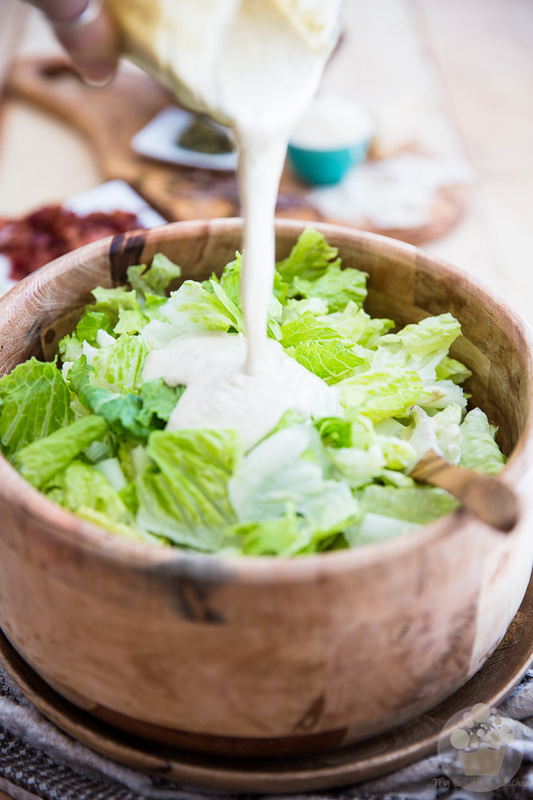 When you are ready to serve, tear the romaine lettuce into bite size pieces and place it into a large salad bowl; pour the dressing right over the lettuce (use as little or as much as you like, I usually use the whole batch) and toss delicately until the lettuce is completely covered in creamy dressing. 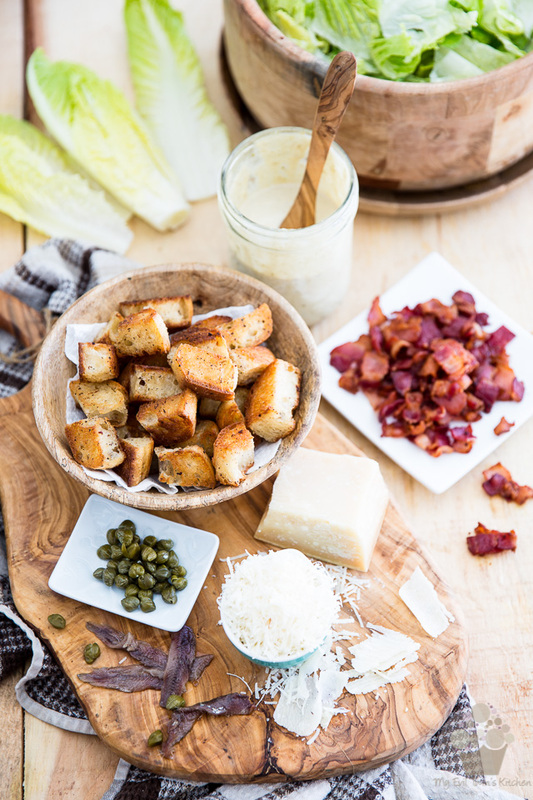 Top with the warm croutons, bacon bits, shredded Parmesan cheese (as well as a few shavings, if desired), chopped anchovy fillets and capers. *you can omit the egg if you'd rather not consume raw eggs but your dressing will be much thinner. 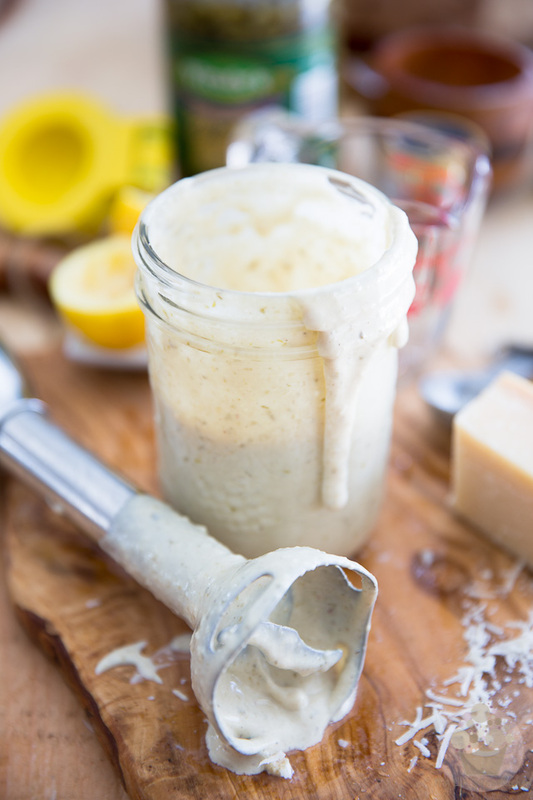 The Creamy Caesar Dressing will keep in the refrigerator for up to a few weeks. 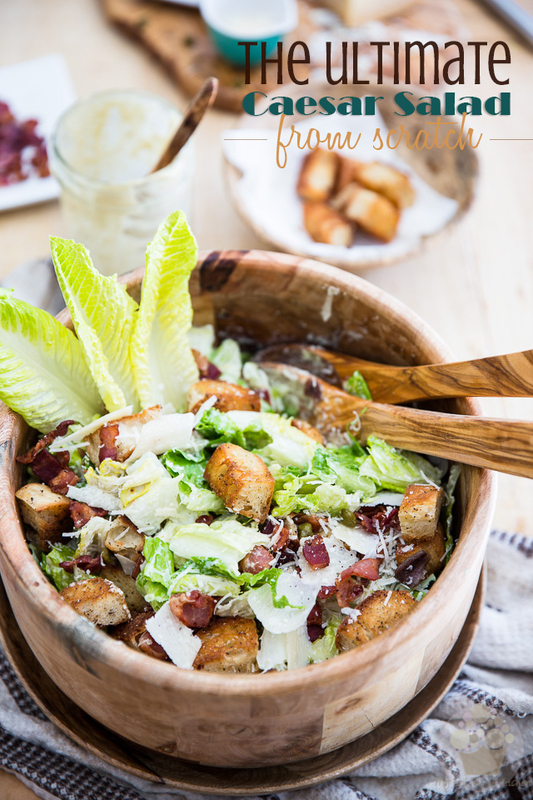 My Caesar salad cravings are sometimes out of control, and this looks like the BEST way to reign in the madness. I kinda want to dive head first into the dressing. NBD. Whoa. This does indeed look to die for. 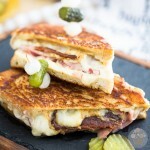 The addition of capers and bacon really speak to me! I use just the yolk but you use the whole egg? I didn’t know one could do that. Thanks for directing me to this recipe. My husband is traveling tonight so,this is dinner ( dude needs meat so this wouldn’t do for him, unless I added steak or salmon) and I’m already looking forward to it! Dressing is sooo good and blending worked like a charm. TY! 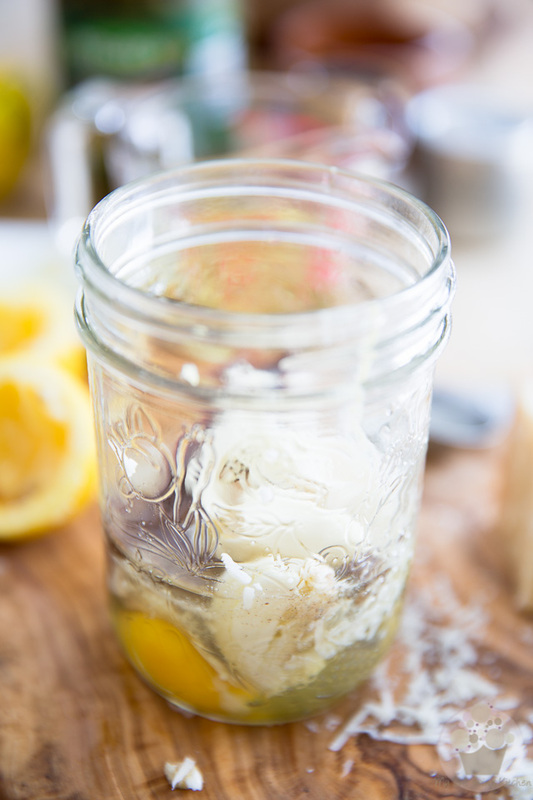 Regarding the raw egg; I have another recipe that uses egg YOLKs. Do you think that would work here? I’m not crazy about anchovy fillets. 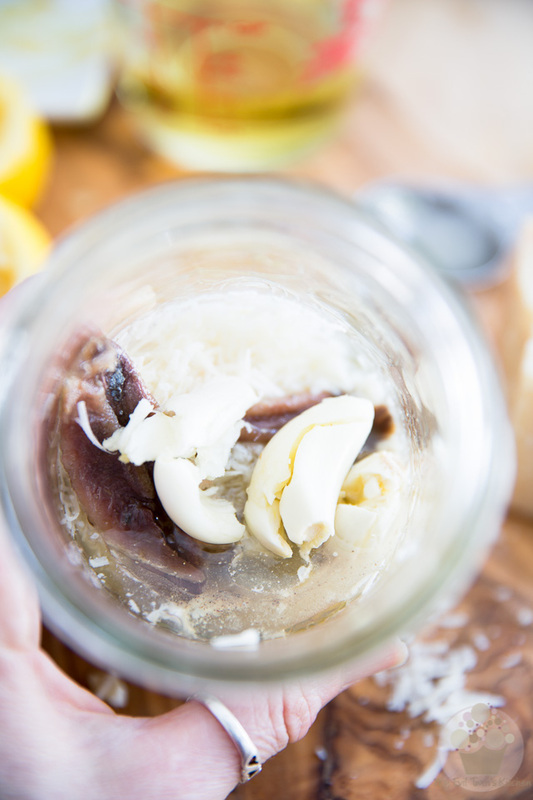 Do you think anchovy PASTE would work as a substitute? 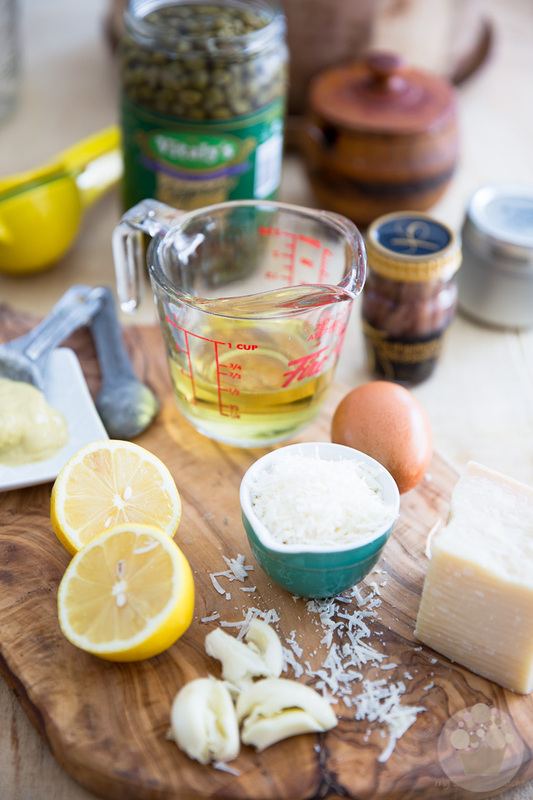 Your dressing might not be as thick if you only use the yolk, but it would still work… as for the anchovy paste, it would do just as well! I made this last week, even the homemade croutons. I thought I had capers, but I did not. It was too late for emergency grocery run, so I used pepperoncini juice instead of caper brine for the dressing. I didn’t have any anchovies either, but that was on purpose. Anyway, I thought the dressing recipe was just about perfect and will be my go-to for Caesar salad, except I’ll have capers next time. 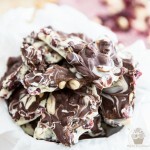 Thanks so much for this recipe. It was delectable. Just wanted to tell you again how much I love your recipe. I’ll figure out something to do about the bacon grease for the croutons. I’m thinking lard or oil. If I knew you were sitting here right now on your computer and checking your messages, I’d wait for your advice. I come a bit late with my advice (hope you haven’t been sitting at your computer waiting all that time!) but what I do to make croutons when bacon isn’t part of the equation is I use lots of olive oil, throw in a little bit of minced garlic, salt and pepper. I used olive oil. It’s still the best salad. I still have a lot of dressing left over. In a mason jar in the fridge so I’m wondering how long it will keep. I’m sure you said in your post and I’ll re-read it. My son just loves this salad. And he’s not a salad eater. He scarfs it down. I’ll buy the bread today – and bacon- and make it again in a couple days!